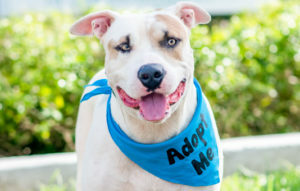 This is Honky Tonk, but you can call him Tonkin, he’s a young American Bulldog available for adoption. When he was younger he was hit by a car but has since recovered. People frequently call him “a big ol’ hunk of love” due to his sweet nature. He loves to play with toys and is very toy motivated for training. He learned how to sit, down, stay, come, wait, and walk on leash during our Train to Adopt program. He is good with other dogs but since he’s a big dog, some dogs don’t take to him too well. He is very friendly with all people though he is working on not mouthing them when he gets too excited. He may not be great in a home with small children as he can knock them down during play. If you want to meet with Honky Tonk then please contact This is the dog! At 305-508-7387 or email them at adopt@thisisthedog.com.